I am indeed surprised that there is only one review for such a masterly work. Do not go by the year that it has been perfromed in because it is better than most modern recordings, I agree with the reviewer before me that the clarinet quintet is really good but, i would like to add that so is the other work specially the piano quintet. The recording is crisp and most importantly clear, there is no distortion of any kind. The Amadeus Quartet seems to have only one thing on their mind and that is to deliver a smooth interpretation of the sextets and quintets. Finally let me put it this way the playing is slow I have to admit, but I prefer to walk with Brahms music than run with it. A little patience on your part will reward you with one of the best chamber music ever. As much as I love his symphonies, I've never warmed to Brahms' chamber-music - not even his Clarinet Quintet where he is athirst for Mozart. True, the Andante from the Third Quartet averted suicide on Wittgenstein's part but I am mystified as to its attractions. If I were about to send myself to Boot Hill, it'd be the last work I'd reach for in desperation: it might have the opposite effect! I suspect my antipathy is attributable to the shortcomings of this set which I've owned since 1991. 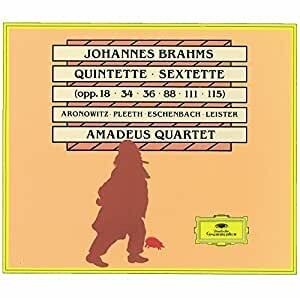 The Amadeus Quartet grind away in their usual, lumpy fashion (Norbert Brainin's vibrato is pulsar-like in its wobble - the opening of the First Sextet is unlistenable). Karl Leister plays smoothly in Opus 115 and perhaps overly so. I cannot detect any overwhelming excellence in the Piano Quintet with Eschenbach at the keyboard. Worse still, the remastering is horrid: these late-Sixties recordings sound aged to the point where they warrant a mortician. Sadly, first impressions count. There may be more to these works than what I realise. The well is poisoned. 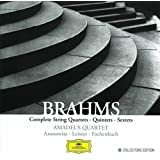 The Brahms Clarinet Quintet and Op. 18 Sextet recordings by the Amadeus Quartet have deep personal meaning for me and I have owned the performances on LP since I was a teenager. A few nights ago, I listened to the Quintet as reissued here on my second stereo system (mid-fi units) and again marvelled at the music's flow and passion, the eloquent performances -- and was about ready to just turn it off during the Scherzo. That's how bad the remastering is on this set - grainy, harsh treble, lack of warmth, haze. The problems afflict all the pieces. Really a darn shame because it should be a marvel. Do not purchase. After I loved DG's vynil record of Brahms' clarinet quintet, Im glad to have found this performance on this CD. The quintet is thoughtful. Slow, but very rich. You should concetrate while listening to it, but you'll be rewarded. Leister's clarinet is rich and emotional. The co-operation between the amadeus quartet and the clarinet is also very good. Where is the old Marlborough Festival recording with (I believe) Casals, Stern, et al?